A genetically modified salmon seen next to a wild salmon. The fish are bio-engineered to grow twice as fast. Photo courtesy Rep. Geran Tarr. At issue is a U.S. company’s plan to create Atlantic salmon eggs for fish farms that include a Chinook salmon gene. AquaBounty hopes to produce fish that grow to market size in half the time – Begich calls it Frankenfish. Last year, on the day after Christmas, the FDA officially announced its initial ruling in favor of gene-modified salmon. Begich says it’s like they were trying to slip something by when Americans weren’t looking. An FDA spokeswoman, though, says they publish documents when they’re complete. In a letter last week, Begich asked that they avoid such surprises this season, and he says they assured him the document isn’t coming soon. “At least they’ve responded, which is a good sign that they recognize how important this issues is and they can’t rush it through at the end of the year because they want to,” Begich said. Nearly 38,000 people wrote comments to the FDA about AquaBounty’s plan. Most were against it. Begich, like Alaska fisherman, says the modified salmon could escape and damage the state’s wild stocks, and he says they’d hurt Alaska salmon in the marketplace. AquaBounty says its fish will be sterile and reared inland, in Panama, so that they can’t escape and harm natural populations. 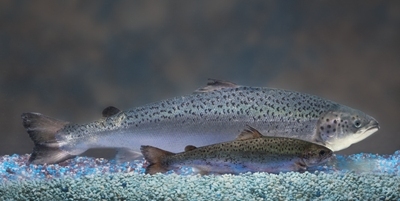 Canada last month cleared the firm to produce genetically modified salmon eggs for commercial use at its hatchery on Prince Edward Island.